In the living room, you want as much of the furniture to be on the rug as possible. This actually makes the room appear larger and defines an intimate conversation space all at the same time. Having all four legs of any couches and chairs on the rug is ideal. But if your couch is against the wall and you can’t see the back legs as well, you can usually get away with having only the front legs on the rug. 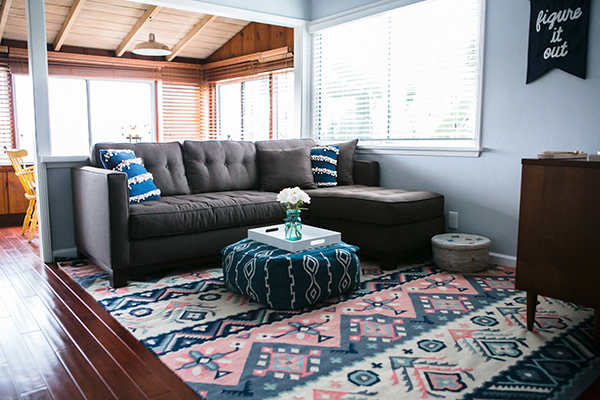 When it comes to width, Sara says that a good rule of thumb is to make sure the rug extends at least 6 inches of either side of the couch. The dining room can be a tricky space to measure since you have to account for chairs being pulled in and out without catching on the rug. Sara from Lulu & Georgia says to first measure the table’s length and width, then add 54 inches to each measurement. This will allow at least 27 inches on each side for the chairs to pull out. If you are buying one large rug to place underneath your bed, Sara recommends that the rug should extend at least 2-3 feet on either side of the bed. If that large of a rug is simply out of your price range, a good alternative is to opt for a traditional “bedside” layout. 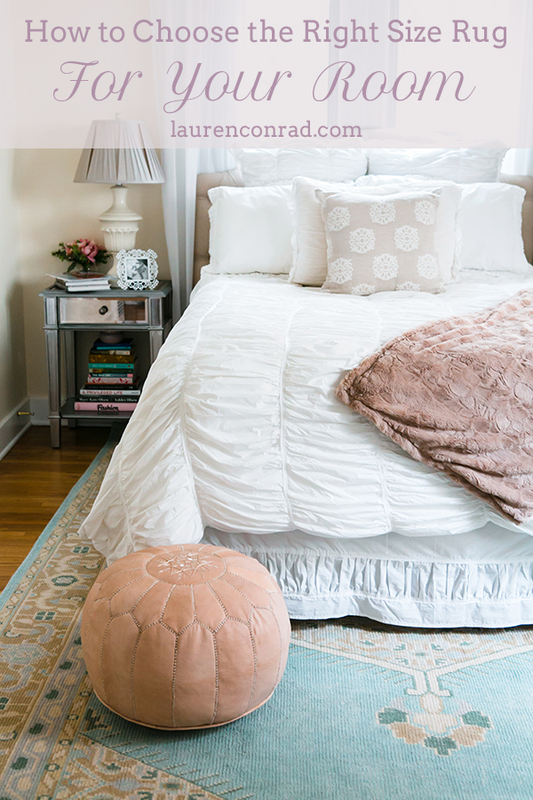 This features two small rugs on either side of the bed and one rug at the foot of the bed. For a guest room or kids’ room with two beds, consider placing one rug between them. Many people forget about the hallways when they are decorating with rugs, but a runner is a beautiful way to make a statement in this often neglected space. Sara says to measure the hallway and then subtract 12 inches from the length and width. This will allow for a six-inch border all around. If you have an extra long hallway, using two runners laid end to end is perfectly acceptable. When you’re measuring your room for a rug a good trick that Sara uses is laying out newspaper in the area that you are considering covering. This will give you a visual reference point and help you figure out the proper size. Also, make sure you consider doors and vents when measuring. You want to make sure your door can open and close over the rug! If you’ve measured your space and the right size rug is simply out of your budget, all is not lost. A décor trick that is also particularly on trend right now is layering rugs. You can buy a larger sisal or jute rug (which tend to be much less expensive) as a layering piece, and then layer your smaller dream rug on top. We also teamed up with Lulu & Georgia for an exclusive 20 percent off discount when you use the code TEAMLC20 (expires May 4). Enjoy! What interior décor posts would you like to see on the blog next? P.S. Here’s how to stop a rug from shedding!